Did V.A. Shiva Ayyadurai Invent Email? Now includes both the original 2012 article comissioned by the Washington Post, a lengthy extension covering Ayyadurai's susequent claims added in August 2012, a second update focused on Ayyadurai's new book The Email Revolution: Unleashing the Power to Connect (Allworth, 2013), and a third update covering the evolution of Ayyadurai's public relations campaign over the next two years. This page has become rather long, so here is the one paragraph version, focused on some inaccuracies in recent press reports (added September 2014): V.A. Shiva Ayyadurai is not a member of the MIT faculty and did not invent email. In 1980 he created a small-scale electronic mail system used within University of Medicine and Dentistry of New Jersey, but this could not send messages outside the university and included no important features missing from earlier systems. The details of Ayyadurai’s program were never published, it was never commercialized, and it had no apparent influence on any further work in the field. He does not “hold the patent for email” or have a copyright on the word email, though in 1982 he did register a copyright claim covering the exact text of a program called "EMAIL." The U.S. Government has not recognized him as the inventor of email and he did not win the Westinghouse Science Talent Search for his program. Electronic mail services were widely used in the 1960s and 1970s and were commercially available long before 1980. To substantiate his claim to be the "inventor of email" Ayyadurai would have to show that no electronic mail system was produced prior to 1980, and so he has recently created an absurdly specific and historically inaccurate definition of electronic mail designed to exclude earlier systems. Ayyadurai has not even been able to show that he was the first to contract “electronic mail” to “email” or “e-mail” – his first documented use is in 1981 whereas the Oxford English Dictionary shows a newspaper usage in 1979. Despite Ayyadurai’s energetic public relations campaign, which presents him as the victim of a racist conspiracy financed by corporate interests, he has not received support from any credible experts in email technology or the history of information technology. His claims have been widely debunked by technology bloggers and articles based on them have been retracted by the Washington Post and the Huffington Post. Read more about Did V.A. Shiva Ayyadurai Invent Email? Below is a message I sent to the Washington Post's Ombudsman outling my concerns with the paper's failure to follow through on the corrective process he had outlined in his "Mea Culpa" to its readers regarding Emi Kolawole's story on the "Inventor of Email" and his initial defense of that story. This was two days after the paper decided not to publish the article it had comissioned from me. I received a prompt one line acknowledgement and promise to investigate but, a month later, nothing further has arrived. Over the weekend the Washington Post delivered its response to a storm of protest over last week’s story claiming that the Smithsonian had “honored” V.A. Shiva Ayyadurai as the “inventor of email.” This came in the form of the “Reader Meter” column written by Patrick B. Pexton’ the Post’s Ombudsman. See http://www.washingtonpost.com/blogs/omblog/post/reader-meter-who-really-invented-e-mail/2012/02/24/gIQAHZugYR_blog.html. Summer reading for historians of computing -- suggestions needed. Please consider helping the community sharpen its engagement with new ideas. Back in graduate school I read feverishly in labor history, business history, history of technology social history, organizational sociology, etc in preparation for my oral examinations. My classes covered still more eclectic topics, ranging from a "greatest hits" of literary theory to nonparametric methods. Over the ten years since I physically left Penn I've been focused on an ever more specialized set of literatures, primarily the burgeoning history of computing field, which I know in ever more depth. In general I've also been doing more writing and less reading. Read more about Summer reading for historians of computing -- suggestions needed. 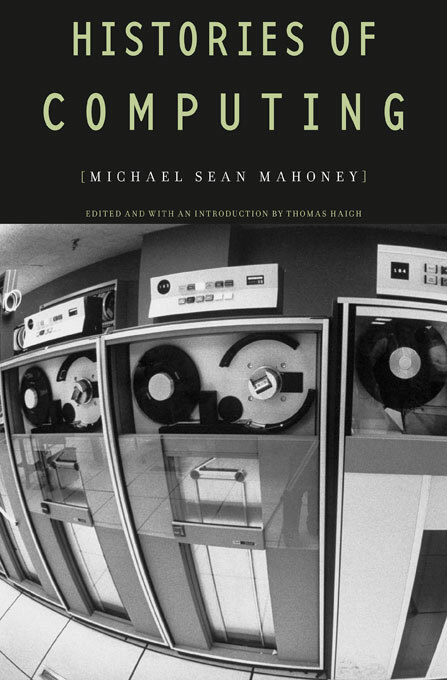 Earlier this week I received a full set of authors copies of Histories of Computing, the edited works of Michael S. Mahoney on the history of computing. These were shipped from the Trilateral warehouse, which handles Harvard distribution, so I assume the book can now be ordered. I’ll be sure to set aside one or two copies for the SIGCIS book auction in Cleveland later this year.